Tim Tebow has played on many big stages before, so he knows what to expect. Against the Pittsburgh Steelers everyone thought Tebow would struggle against the leagues no.1 defense, but that was not the case. 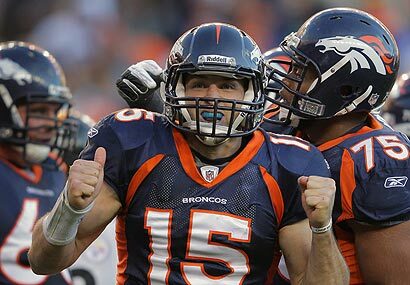 Tebow threw for over 300 yards and connected on a touchdown pass in overtime to give the Broncos a 29-23 win. I will be the first to admit I did not give the Broncos or Tebow much of a chance that's for sure. The Broncos run the ball well and passed even better against a Pittsburgh defense that looked old and tired. The Steelers had their chances, but did not make the most of them. You have to credit the Broncos and Tim Tebow with the Steelers having an off-night I guess. No matter what Tebow-mania will keep moving for at least another day it seems. People love Tim Tebow and he sure did not hurt his stock any with yesterday's performance that's for sure.